Carmenere Vineyards at Viña Tipaume. 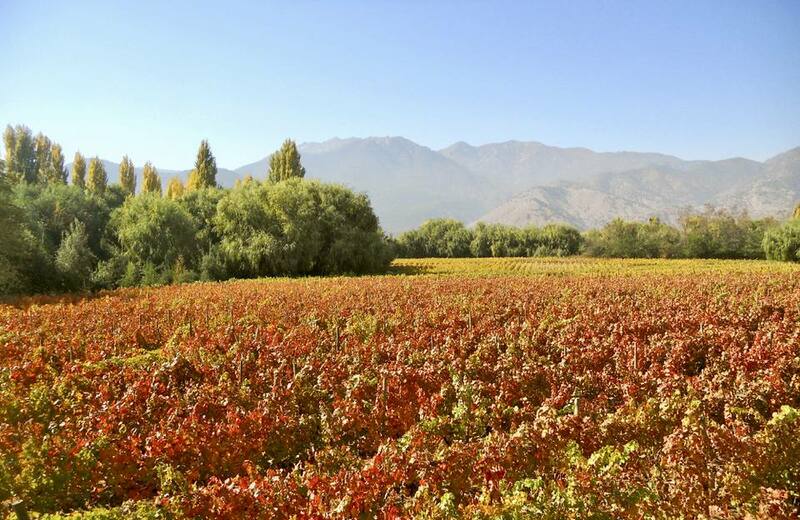 Brought to Chile in the late 1800s, Carmenere has become Chile's signature red wine grape and for good reason. Deep red in color and often blended with Cabernet Sauvignon or Merlot, in a throwback to its Bordeaux roots, Carmenere is a dark-skinned, dry wine with lower levels of acidity and fairly well-established tannins. Being food-friendly, well-priced and enjoying decent distribution, Carmenere beckons wine newbies and full-throttle oenophiles alike. The Carmenere grape variety was originally from France (the Medoc region of Bordeaux to be precise) but has since found favor in Chile's Central Valley, where it is grown with gusto. This grape has an interesting heritage in Chile, with many mistaking it for Merlot initially. Not surprisingly, "Chilean Merlot" was known for having a different palate profile than other New World Merlot bottlings. Once DNA tests confirmed it as Bordeaux's long-lost Carmenere (destroyed by phylloxera), thriving in Chile's unique, phylloxera-free terroir, the grape became known worldwide as Chile's red grape and they've had immense success with its cultivation. It is bottled as a single varietal wine and as a blend, most often with Cabernet Sauvignon. It is a red wine grape with an intense, inky violet color. The aromas most often associated with Carmenere are tobacco, tar, leather, bell pepper, dark fruit, coffee, and chocolate. The palate profile can echo the nose but is largely dominated by cassis, cherry, blackberry, blueberry, plum, pepper, earthy nuances, vanilla, and spice. Generally, Carmenere demands a longer growing season and is often one of the last grapes off the vine during harvest. If picked before fully ripened, the green pepper notes of pyrazine can set in and pervade both the aromatic profile and the delicate balance of rustic fruit flavors. Delicious with all sorts of rustic barbecue themes, give Carmenere a try with sausage, steak, pork loin, poultry, pasta with meat-based sauce, game, curries and various grilled meats. Serve at a cool 65 degrees. With its lower acidity levels, Carmenere is not a grape that is built to age and is best consumed within a couple of years of its vintage date.